After looking through the Little Book of Things to See we decided to visit South Shields. It is somewhere that feels pretty far from our house in the car, but only takes half an hour on the metro from Central Station. Using the booklet we planned to visit The Word, the National Centre for the Written Word and Haven Point the leisure centre. We had wanted to try out The Little Play Cafe for ages too, so planned to visit there for a child-friendly lunch. 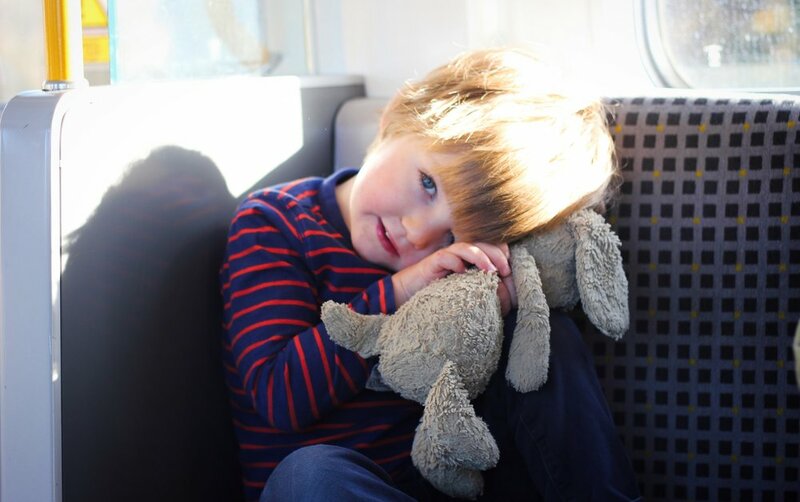 Because under 5s are FREE on the metro it cost less than £10 for our family of four to get to and from South Shields. Before our day trip we ordered a Pop card. This is a bit of a game changer for me for public transport. It works like a London Oyster card in that you top it up either online or at the ticket stations then scan it when you get on and off the metro. I never have cash on me, so it's brilliant that I can top it up online. It was the kids' first time on the Metro and they loved it. We went to Thomas-land in Drayton Manor over the summer and my little boy kept saying it would be just like that, but REAL. Because we'd told him we were getting the train and going swimming, he kept saying we were going on a holiday. Our 'holiday' started on the train, where the kids were fascinated looking out of the window. Their little minds were blown that we weren't getting off at the first station, so we had to explain about 19 times over that nope it wasn't this one. But after about half an hour we arrived into South Shields. We walked to the Word, which was about 5 minutes from the station. The building is huge and really impressive. Having never visited a centre for the written word before I hadn't been sure what exactly to expect, but it was like a massive, bright, state of the art library. There was quite a lot for the kids to see. We visited the pirate exhibition where the toddlers had fun dressing up. Us grown ups were fascinated by the biggest interactive maps we'd ever seen which took up a whole table. The kids also enjoyed colouring in on ipads which were hooked up to flatscreen tvs, and we all liked looking out at the river tyne through some impressive telescopes. There were also lots of areas in amongst the books to sit and look through books together and some kids crafts set up to do on the ground floor. I don't think The Word is the type of place where you would spend a whole day, but it was a great place to look around for an hour or so. The Word hosts kids' groups and classes and we had arranged to go a TechyTots class. This class is focussed on coding through play. Before I got in I had no idea how anyone would manage to make coding fun for toddlers, but it was actually a fab class. It's aimed at 2-6 year olds, so a brilliant option for anyone with siblings. It was lovely to be able to go to a class with my little boy too, as since he's started school nursery there aren't many groups which run at weekends. The class was set up in lots of stations. There were quite a few robots which needed the kids to do various things to control them. Our favourite was the codeapillar where the little ones controlled the direction it travelled in by adding different pieces. Hard to explain, but made sense when we were there. My little boy could not get his head around the fact that you weren't meant to push the robots and I had a tiny bit of anxiety that he would end up breaking them. But Gemma who was running the class was so nice and reassured us they were robust, she also said it sometimes took kids a few sessions before it clicked that how everything worked. Some of the stations weren't technical, but Gemma explained that even those were teaching kids the principles of following instructions which is central to coding. Some of the robots were facinating and after 5 minutes of me controlling one around the room, my husband gave me a quick nudge and reminded me they were really meant for the kids! Most of the session was spent free playing with the stations, with guidance from Gemma who was always near by, then finished with a sing song. The Techy Tots classes are held at The Word at 10:30am on Saturdays, and can either be booked up for a term or you can attend on a drop in basis for £4.50 per session. After the session was finished we headed to The Little Play Cafe which was a 10 minute walk from The Word. We've wanted to visit for ages, but never got around to it. The Little Play Cafe was perfect for our two. There were plenty of toys, including a small ball pool, kitchen area, dolls house and books which meant the toddlers were entertained from the moment we got in there. It's FREE to use the play space as long as you are buying food or drinks in the cafe. There was none of our usual bribary to stay at the table whilst we waited for our food as they were totally free to look around the cafe and play with whatever they fancied. There was even a screen projected on the wall which was playing every toddler's favourite - Peppa Pig. As you would expect there was a kids' menu which should please even fussy eaters. The sausage and beans we ordered for the kids was £3. I ordered from the brunch menu, with my breakfast costing £5.50, and my husband's tuna melt was the same price. We all enjoyed our food and every plate was cleared. Ignoring the age old rule of not eating before you go swimming, we were tempted by both the cakes and the extravagent looking hot chocolates. The little ones loved their little Peppa Pig cakes, although naturally it didn't stop them from digging into out chocolate orange cake or aero hot chocolate. All were really good. Outside of Haven Point - photo credit to South Tyneside Council. Shared with permission. Our final stop of the day was Haven Point. I'd heard really good things about this pool and the family facilities there. I was pretty impressed with the entrance fee, which was £12.60 for our family of four. Haven Point is new and modern, and the changing rooms and pool areas felt clean. The changing areas were unisex with some family changing rooms which meant me and my husband could share the particular joy of sweating whilst trying to get tight clothes onto still damp toddlers. The swimming facilities were great. Alongside Waves in Whitley Bay I would say Haven Point is the best family swimming pool that I've been to. The family pool was huge, and all very shallow so both kids could walk around most of it. There was a play frame with a couple of small slides which my two loved going on. There was also two really big slides that my little boy went on with his dad twice. Within this area there was a small 'proper' swimming pool, so this would be a great one to visit if you were teaching your kids how to swim, as you could move between the fun and proper pools very easily. Top photo credit to South Tyneside Council. Shared with permission. Post swimming hair and a sleeping toddler. After swimming we were all exhausted, so walked back the ten minutes or so from Haven Point to South Shields metro station. Because my two are still pretty little and tire out easily we didn't get around to doing half as much as we could. I would have liked to pop over to the fairground for a few rides, grabbed an ice cream from Minchellas, wandered on the beach, played in South Marine park, or even caught the ferry over to North Shields so they could have experienced that too. Nevermind though as it just means we'll have plenty more to do if we plan another family day out. As it was, my little girl fell asleep before we even got on the metro and didn't wake up until we were back at Central Station. We had a brilliant time on our day out with Metro, and as we are about to move to a house only 10 minutes walk from the nearest metro station, I think we'll be ticking off lots more in our Little Book of Things to See. I already have my eye on Roker Pier, Bill Quay Farm and Tynemouth Boating Lake. Where is your favourite place to visit by metro? Have you picked up a Little Book of Things to See yet? Leave us a comment below. Disclosure Policy - This post was sponsored by Tyne and Wear Metro. All views are my own.